Lor San Tekka is a Star Wars minifigure released in 2016. Lor San Tekka features a dark tan printed legs and hips, along with a matching torso and arms printed to show his robe and belt. 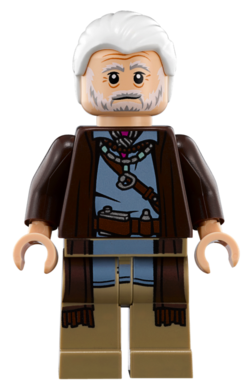 His printed face shows his bearded and aged face, and he also comes with Count Dooku's hairpiece. Lor San Tekka was visited by Poe Dameron under the orders of Princess Leia as he possessed a part of the map to Luke Skywalker. When conversing with Poe, the First Order arrives, and Tekka was brought to Kylo Ren. Ren murders him when Tekka brings up Ren's parentage. Facts about "Lor San Tekka"
This page was last edited on 10 December 2016, at 00:49.